Sweet Potatoes are native to Central and South America and are one of the oldest vegetables known to man and have been grown for at least 10,000 years. It is a dicotyledonous plant that belongs to the family Convolvulaceae, tuberous roots are a root vegetable. It is at the top of nearly everyone’s healthiest foods list. It contain of vitamin A; vitamin C, and some calcium, potassium, and iron too. It may be one of nature’s unsurpassed sources of beta-carotene. 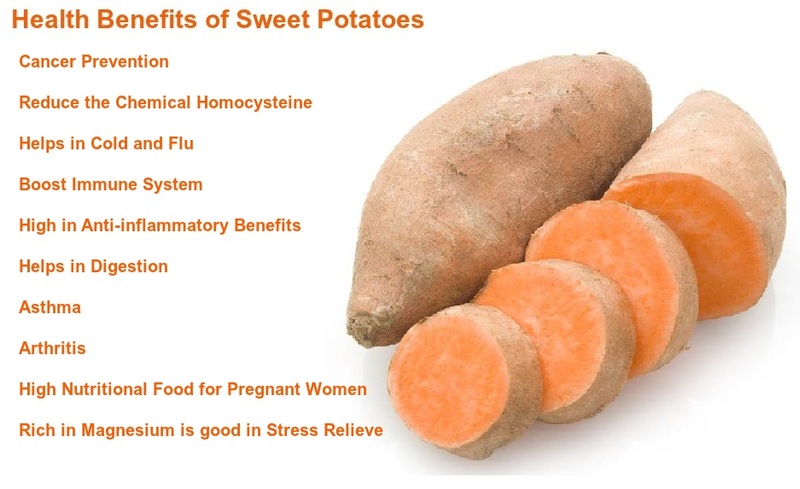 Let’s see some of the common health benefits of Sweet Potatoes. Sweet potatoes are also a surprisingly nutritious vegetable which are high in vitamin A, vitamin B5, B6, thiamin, niacin, riboflavin, and, due to their orange color, are high in carotenoids. Vitamin A may help protect against sun damage. A nutritious, delicious food that should pose no significant health risks. The sweet potato is an underground tuber and grows on the roots of a plant. They can be consumed in a variety of ways, but are most commonly boiled, baked, steamed or fried. 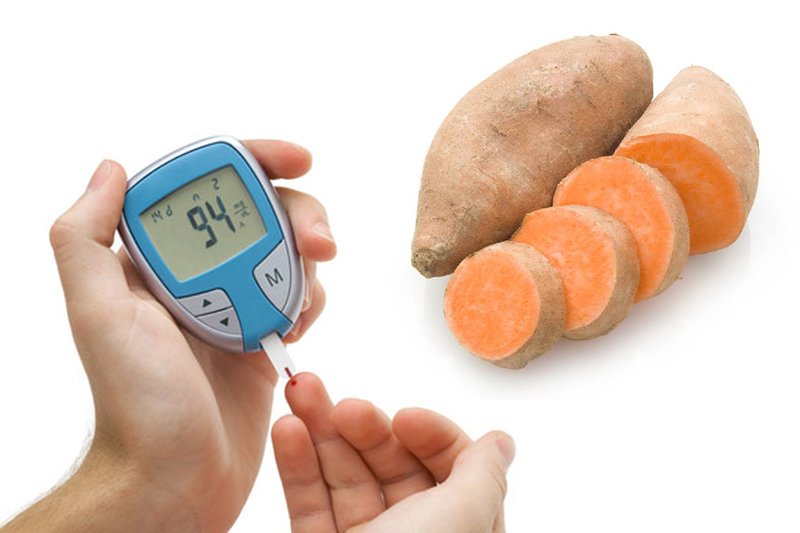 Sweet Potatoes are Good for Diabetes ? For a diabetes-friendly diet, you need foods that will keep your blood sugar levels in check. According to studies, Sweet potato may have health benefits for diabetics. Sweet potatoes are considered a superfood for diabetics, says the American Diabetes Association. The glycemic index of sweet potatos is way lower than white potatos. When it comes to diabetes-friendly foods, all potatoes are not created equal. To keep your blood sugar levels in check, it’s best to reach for sweet potatoes, which are high in fiber and vitamins. When boiled, they are a low glycemic index (GI) food, meaning they won’t increase your blood sugar as much as regular potatoes. Any discussion of food and diabetes management should begin with count how many grams of carbohydrates you eat in a day. As a rule the ADA suggests aiming for a range of 45 to 60 grams of carbohydrates per meal. One large baked sweet potato provides over 37 grams of carbs, which represents most of your allowance for that meal. They contain a high amount of fibre, which also helps to reduce levels of “bad” LDL cholesterol in the body. According to the American Diabetes Association, sweet potato has high fiber content, antioxidant nutrients like Vitamin A, Vitamin C, zinc, and other micro-nutrients such as potassium, magnesium, iron and Vitamin B, which help in diabetes management and prevention of diabetes complications such as heart attacks. Beta-carotene presence in it may reduce the risk of breast cancer in premenopausal women and ovarian cancer in postmenopausal women. Sweet potatoes are a good source of vitamin B6. Vitamin B6 helps reduce the chemical homocysteine in our bodies. They are good source of vitamin C. Vitamin C is important to help ward off cold and flu viruses, few people are aware that this crucial vitamin plays an important role in bone and tooth formation, digestion, and blood cell formation. It helps accelerate wound healing. They are a good source of magnesium, which is the relaxation and anti-stress mineral. Magnesium is necessary for healthy artery, blood, bone, heart, muscle, and nerve function. Due to the color-pigmented vitamins, sweet potatoes are high in anti-inflammatory benefits. They are a good source of dietary fiber, which helps the body maintain a healthy digestive tract and regulates digestion. They are effective for curing congestion of the nose, bronchi and lungs, thereby giving relief from asthma. Beta-carotene, magnesium, zinc, and vitamin-B complex make them a hugely important food source for managing arthritis. The water where sweet potatoes are boiled can also be applied externally on joints to ease the associated pain of arthritis. Sweet potatoes are highly beneficial in the course of pregnancy because of their high nutritional content. Sweet potatoes are high in iron, so not only do they help if you suffer from anaemia caused by iron deficiency. Sweet potatoes are bursting with beta-carotene, a pro-vitamin that our body converts into vitamin A, and as a result gives the immune system a boost and helps to protect cells.